When you are a beginner in skating and stuff you are sure to get your knees and elbows skinned off because we all know No pain No gain… Still, longboards are the safest options as they are designed in a way that they decrease your risk of falling off. They have a bigger deck and enable you to make turns smoothly, so they are much easier to control than a skateboard. This makes the longboards relatively beginner friendly, and this goes without saying that they will keep you safe from all the stumbling and bruising. But here’s the thing even if you know that you want a longboard, to begin with, you have no idea which one to choose. It might be possible that your friend has one, but your friend’s longboard is suitable for him or her only; you need to make your own choice that you will be comfortable with. Having so many options in longboards, it’s really a hustle choosing the right one for yourself… But what are we here for if you have to do all that hustle. 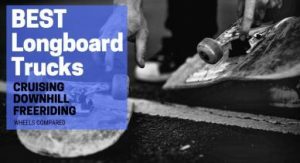 So sit back, relax and continue reading as we have listed for you the longboards that will be definitely the best ones for beginners like you. 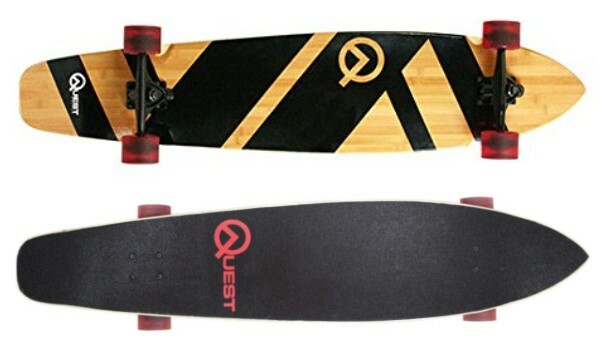 The Quest Super Cruiser longboard is well known for its high-quality material and components. This makes it highly suitable for beginners as it is very durable and will endure all the beating and grinding. 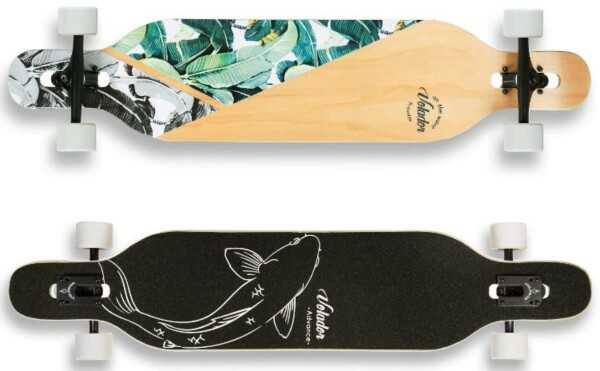 The deck is 44 inches long and 9 inches wide that is why it gives the perfect platform for newbies to understand how different foot placements will work. High-quality maple wood and bamboo make up the deck. The bamboo provides great flexibility to the deck and hence, you get the right flex for your riding. Now, you are getting your first skateboard that will always remain special. I am sure of it because I still have my first skateboard in my garage. Therefore, it needs to be something impressive not just in functioning but also in looks. The Quest super cruiser is really what you need. The style is exceptional and really eye catchy. It has been designed in a very artisan kinda way. The black pattern on the bamboo bottom and intricate detailing make it look super cool. 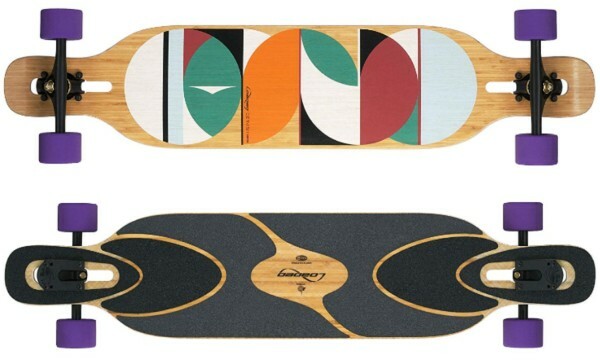 Moreover, the deck has a grip tape with the Quest logo, and this is what makes it stand out. The weight of the board is around 10 pounds which makes it neither too light nor too heavy. So, it’s just the right weight for a beginner. The 70 mm wheels have a hardness of 80A, and for this price, these wheels are better than the average. Aluminum trucks have been used in the Quest cruiser with 7-inch hangers and ABEC 7 bearings. The bearings might require an upgrade, but you will definitely see how the performance changes with the upgrade. Hence, I will surely recommend you getting an upgrade. The trucks ensure that you enjoy a smooth ride as they allow smooth turning and minimal biting. So, this longboard is worth your money as it’s not only affordable, but it performs and looks far better once you hit the road. The only con that has been reported and that we found was that the bearings are not durable. But as mentioned earlier, getting an upgrade is no big deal. In addition, some people might suggest you that the Quest cruiser is long but believe me for a beginner it’s just the perfect length as it will really help you become a pro longboarder. The Volader longboard is available in 42 inches as well as 46 , but we will be focusing on the 42 inches freeride longboard. Now, this board is really something when it comes to its graphics and looks. The bottom, as well as the top, have artisan graphic designing. The grip tape top has really cool graphics that stand out on the black platform. The deck is an 8 ply natural hard rock maple wood with striking vintage looks, and it has been made with great care so that all the materials used on this board remain environmentally friendly. This is the part that is to be appreciated and encouraged. The deck is mounted on 7-inch aluminum trucks that are equipped with reverse kingpins. These kingpin trucks can be adjusted to 45 degrees or 50 degrees to enhance the maneuverability. It will provide perfect balance, stability and ease to a first time longboard user. The PU wheels that you will ride on are 70mm by 51mm which is the average size and thickness is 78A. The wheels are durable and bearings installed are the ABEC 9 bearings. This 42-inch board weighs only 7.3 pounds which is pretty good for a board this long. You will really enjoy riding on it to your school or to the market or just for fun too. Moreover, it will make your longboard learning really easier as it provides a pretty smooth ride and allows you a tight turning radius. If we consider safety, then this board has a design that perfectly ensures the safety of the cruiser. 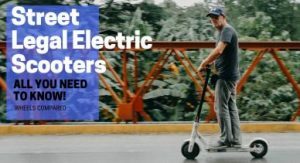 Whether you are cruising around, taking turns or riding downhill, it will provide you maximum stability so if you are a first-time rider shake all your worries off. As for the cons of the Volador 42 inch longboard, the color of the wheels might not be acceptable for some people. The white wheels might look good right out of the box, but when you start cruising with your board, they will get all dirty. Moreover, once used the white wheels tend to turn greyish white. So, this is a , but the white wheels also complement the entire look of the board. Hence, this cant be helped unless you clean the white wheels right after you are done riding your longboard. As for the other things, I think it’s a pretty decent board in a very affordable price range. Now, this one’s a winner when you are just buying a longboard for learning purpose, and you sure don’t want to break your bank. Its affordable, durable and won’t demand an upgrade even after a good beating. The deck is made up of high-quality bamboo wood and has been designed exclusively in Los Angeles. It has a length of 44.1 inches and a width of 9.4 inches. It is very stylish and has a vintage look. The best part is that it is available in many different designs and graphics that are in exuberant colors. Aqua fishtail, aqua pipeline, black pipeline, golden sunset, marine layer and sapphire sunset to name a few. My personal favorites are sapphire sunset and golden sunset. The deck has an artistic finish and is firm which will really help out the beginners in having a stable and smooth ride and quick learning. The wheel wells are milled in such a way as to reduce the impact of wheel bite. The 7-inch aluminum trucks are equipped with PU cast black bushings whereas the wheels have ABEC 7 bearings. The wheels have dimensions of 70 mm length and 51 mm width, and the hardness is of 85A. Moreover, the Ten Toes Emporium board is light enough to carry around with you whenever you want. The turning radius with this board is great and the wheels sticky and will roll over smoothly. So, this longboard will allow you to cruise around your neighborhood and take curves and turns around the pavements really smoothly. I believe that the wheels are a bit soft but for a beginner, it will be alright as you will be able to turn and slide smoothly and if you are a pro then you can handle anything well, so it’s a win-win. Nevertheless, the wheels have a hardness of 85 A which makes them pretty shock absorbing so you don’t have to worry about your safety. Moreover, the bushings and bearings will definitely need replacement. 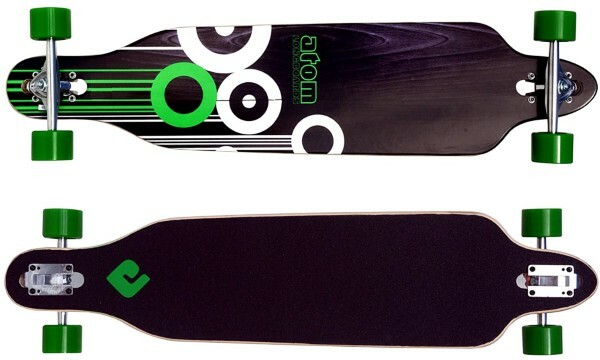 If you are a beginner and you are learning to ride downhill then the Atom drop through longboard is definitely for you. It is best known for its great stability and steadiness hence; it will really help you cruise around not only on the road but also on the steep areas. The best thing about this one is that it is available in two different sizes; one is 41 inches long and the other one being 39 inches long. 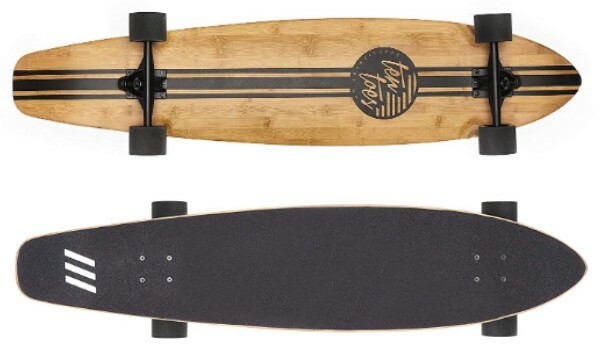 I reviewed the 41-inch Atom drop through longboard; hence I’ll be considering that one. Atom also offers you a variety of colors that you can choose from according to your liking. What more could you ask for right and that too in such an affordable price? The deck is fully maple wood with a lamination that makes it durable. It has a really good flex which will provide you the balance that no other can. The grip tape provides a firm grip between your feet and the deck and hence, prevents you from falling off your board. In addition to this, the graphical design on its bottom with a small logo on the grip tape makes it look simple yet stylish. This longboard that weighs only 8.8 pounds has the usual aluminum trucks that are extra wide as compared to other longboards. The distinguishing feature is that the 245 mm trucks have kingpins which you can adjust as to your ease of turning. The 70 mm wheels with a 78 A durometer and ABEC 9 bearings are very durable and shock absorbing which makes this longboard very suitable for beginners. This longboard is designed with a low center of gravity so it will provide you the perfect balance and stability with no problem while cruising through grassy hills or while going off a curb. The standard bearings in the Atom drop through longboard are quite smooth, so they are suitable for beginners. But, once you get a grip of longboarding, then you might want to replace them. But it is not necessarily a con. The trucks are not impressive, but for this price, they are pretty reasonable. The only thing is that if you are a bit overweight than you will have to replace the trucks otherwise enjoy riding the same ones. What I believe makes this board stand out is definitely its funky and cool graphics, aside from its attractive price and quality. The unique blue surf design will give you the feel of surfing whilst you are longboarding. As the name suggests, this board has a pintail design which will be really suitable for beginners when they will be learning to cruise as it provides high maneuverability. The Pintail board is 39 inches long and 9.4 inches wide. This longboard has a laminated maple deck with a full coverage grip tape top. The shape of the deck has been designed specially to avoid wheel bite. Moreover, a feature that you won’t find on other boards are the wheel flares. They prevent wheel bite like no other can. The 8.5 inches aluminum trucks are pretty durable. The wheels used in this board are 78 A urethane wheels equipped with ABEC 5 bearings. These wheels provide a stable ride to a learner, so the risk of falling off your board or getting bruises is reduced. The pintail longboard weighs only around 7 pounds which makes it super light and convenient to commute. Henceforth, all in all, it is a pretty decent package in an even more decent price range. I would say that this board is more for cruising than freestyling. 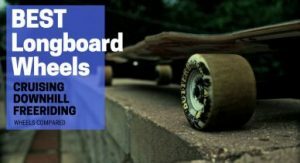 The pintail is not suitable for trying out boarding tricks, but when you are a beginner, you don’t really need to make any tricks you just want to get a grip of longboarding. So for that, the Atom pintail is pretty suitable. Yocaher is really building up its name in the longboard industry and coming up with better and better boards, and this board is no exception. The name itself depicts its distinguishing qualities. This Yocaher Pro speed drop down board is kind of an all-rounder as it is not only suitable for the professional to semi-professional riders but also for the beginners. For beginners like you, it will provide the perfect stability at high speed too. So, when you are learning to skate at a higher speed or downhill riding, then I would say undoubtedly that this one is the perfect pick for you. The 9-ply maple deck is 41.2 inches long and 9 inches wide. The grip tape used is a Black Widow premium grade 80A tape which keeps the feet planted firmly on the platform. This drop down deck is what is most special in this board. This deck is neither concave nor does it provide any flex and this is what makes this board super stable and smooth at low to really high speeds too. The foot platform is pretty lower than the trucks; hence this adjustment provides not only a low center of gravity but also high maneuverability. The deck has been kept pretty basic because what’s more good than an attractive natural deck. The trucks are made of aluminum alloy and are special HD 7 heavy-duty trucks with 80 mm hangers. 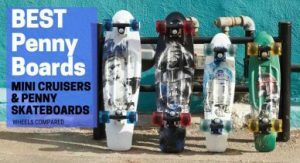 These trucks are solid, and so, they have a high weight bearing capacity and make the Yocaher drop down longboard pretty durable. Its wheels are also different from other ordinary longboards as Yocaher has used its own made Q-Ball wheels. These wheels have a height of 70mm and a compact patch of 52 mm with 78A hardness. It is equipped with ABEC 7 chrome bearings. You will have the best stability and smooth ride whether you are cruising around the town or are riding down a hill at top speed. You name it, and this board has all. When it comes to the cons of this board, I personally feel that there’s not much or should I say there is nothing to its cons. The usual shortcomings that are same in all boards are the bushings and bearings that need to be replaced. But let’s get real, it’s the same in all boards and is a pretty cheap fix so to refer it as a con would be an injustice to such an amazing board. When it comes to the Rimable boards, we know that these are known for their affordable prices and exceptional durability. These are definitely the traits you need in your board when you are beginning with longboarding. It is because you know that you have to learn on it and it will be quite a rough journey so your board needs to be durable to take all the beating and it’s your first time so it better not be heavy on your pocket. The Rimable drop through longboard has got you covered in both these aspects. The drop through style deck is made of 9 ply maple wood and bamboo with laminations. It guarantees the durability of the board. What makes this board stand out is the photo heat transfer graphics that gives an insight into the Polynesian culture. 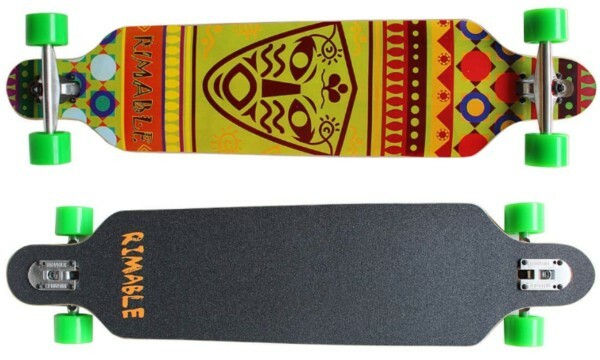 The grip tape provides a firm gripping surface and enables the rider to ride without any fear of falling off. The board is 41 inches long and weighs about 8 pounds. The 70mm by 51mm PU wheels that have a hardness of 85A enable you to take safe turns even at high speed. The 7 inches trucks are made of aluminum and support the bamboo deck to hold a heavyweight. The ABEC 9 bearings used in the Rimable drop through longboard will not wear out easily if they are kept clean. Otherwise, the dirt and moisture might cause them to wear out if not taken care of properly. These durable bearings are its distinguishing features because every other board needs a replacement of its original bearings. The wheels used on this longboard are not much impressive, and trucks might need a replacement but not too soon. The main issue is with the wheels as they also tend to accumulate dirt. But when you look at the price tag, this issue might not seem big. It is because the extremely good quality of the deck compensates for the not so good wheels. So, it’s a pretty fine deal to make. 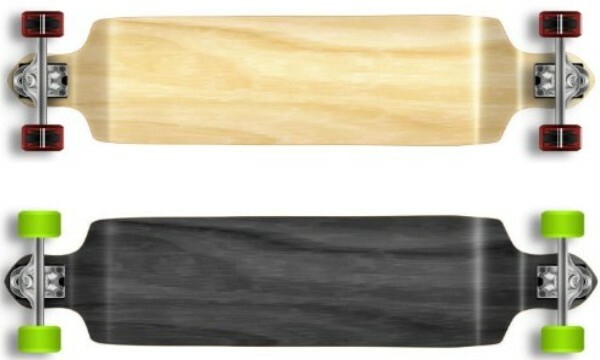 The Loaded boards are specifically made for the professional riders. 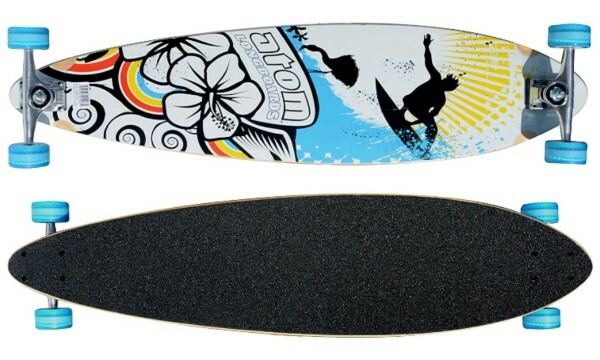 But we have picked this board, especially for the beginners because its design will make you a real pro longboarder. It is easy to balance, easy to manage at high speeds and easy to maintain grip while making turns. The Dervish Sama is a board that is perfect for each and everything freestyling, cruising, carving, pumping, commuting you name it. The 48 inches long deck is made up of a combination of bamboo and fiberglass that is hard to find in any other longboard. This buildup provides the necessary flex for pumping or hard carving. The lower flex is suitable for a bit heavier riders who tend to ride a bit aggressively too. Whereas, the higher flex will be suitable for riders who are light in weight and are more into a responsive feature of the board. But for a beginner, you should try to use different flexes so that you will have a better understanding of how each flex works. The design of the top of the deck and the bottom both are breathtaking. Everything of this Dervish Sama loaded board says MORE. The 180mm Paris trucks with a matte black finish provide great support to the platform and enable the board to carry weight without any damage to the performance of the longboard. The wheels used are orangatang wheels are 75mm and have a hardness of 80A equipped with Loaded Jehu V2 bearings. This setup enables great grip on any surface and a very smooth ride. Moreover, anti-bite technology also works great. So, it is really your dream board. You can think of the Loaded Dervish Sama longboard as a long-term investment as you can not only learn to skate on it effectively but once you become a pro, there will be no board better than this one for all the carving and freestyle tricks. I cannot really think of any con for this one because even its bearings and bushings don’t need replacement as it is highly durable. If anything then that could be its weight, it might feel a bit heavy to some people. However, it is because of its specialized design and quality parts that enable it to perform so well. So, to be honest, it actually adds to its durability. So, go on making some memories with the Dervish Sama longboard. 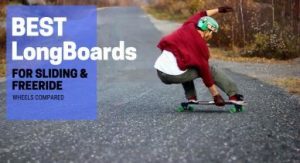 We have tested and reviewed all the above-mentioned longboards, and that is why all these have made it to our list of the best longboard for beginners. They all have their own specialties that make them stand out. In addition, as you are a beginner so here’s a tip for you. If you buy a longboard, it is quite rare that the bearings are durable enough, so it is better to replace your bearings once you get your hands on a longboard. It is a very cheap fix but will enhance your performance to an unexpected level. The Bones red bearings are our personal favorites so you should give them a try. As for the bushings, any medium skateboard bushings will be good to go. 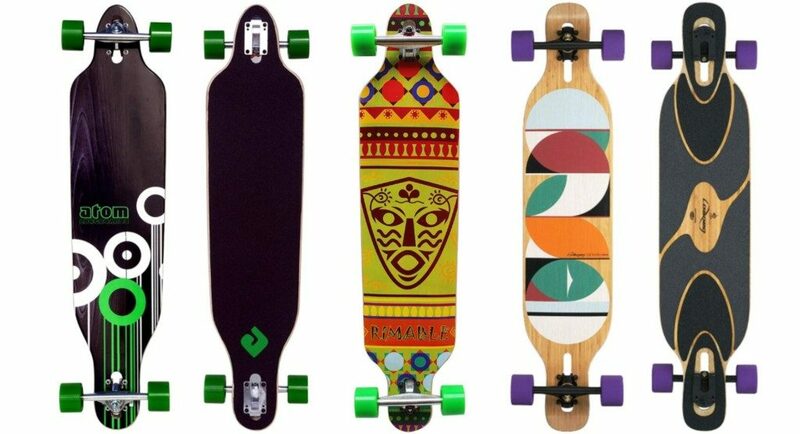 Good luck with your longboarding journey and do let us know which of these boards worked for you in the comments section below.